William Attmore, d. 1800. Journal of a Tour to North Carolina by William Attmore, 1787. 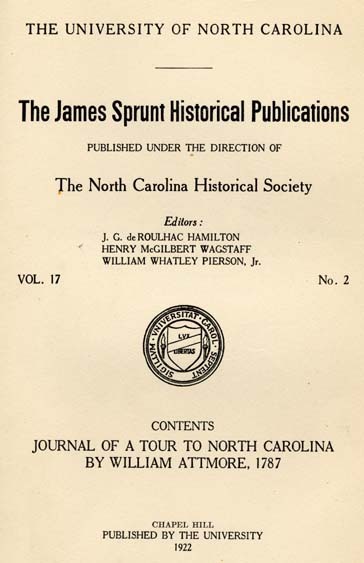 The "Journal of a Tour to North Carolina," written by William Attmore, of Philadelphia, was a cherished possession of his great-granddaughter, the late Miss Rebecca Attmore, of New Bern, N. C. She was a real "Belle of the Fifties," who in character and person reflected the charm of that classic type of Southern womanhood that authors delight to picture. Thomas Attmore of Devonshire, England, Parish of Kentslean, born about 1692, who removed to America in 1713, was the grandfather of William Attmore, merchant of Philadelphia, of the firm of "Attmore & Kaigher." In the winter of 1787, William Attmore came to North Carolina to collect debts owing to his firm and to obtain new business. While on his tour he kept a diary, of which some parts have evidently been lost, but enough remains to form an interesting narrative. The handwriting of the original manuscript is clear and beautiful, and the ink as black as though it had been penned yesterday instead of over a century ago. Only the paper has become faded and torn by age. to whom he was married March 18, 1790. He died in Philadelphia in 1800, and was buried there. Interesting family relics are two miniatures owned by Mrs. Thomas Constable; one represents the wife of Judge Sitgreaves, the other is a memorial of the Sitgreaves men who served in the Revolution. Mrs. Benjamin Huske owns a list or record, of lands held by the Attmore family in England dating from 1337, copied from the records in the Tower of London, and other quaint documents. The notes to the journal furnish other interesting data in regard to some of the persons and places mentioned. Anchor in 4 fathom Water; supposing ourselves a little above Christiana Creek. Wednesday, November 7. At 11 O'Clock A. M. the Fog cleared away, and we found ourselves off Wilmington--At 12, the Ebb beginning we hove up Anchor and made Sail; passed a Brig coming in, having hurricane houses on deck.--And a number Shallops and Boats. Came to, alongside the Wharff at Newcastle and received onboard Mr. William Ford, a Passenger, with his Baggage. I went ashore and paid a visit to Thomas Kean Esqr Sheriff of New Castle County, drank a bottle of Wine with him at his house; then he came onboard with me we sat down in the Cabbin where we treated him with such as we had--We got into good humour; when our Captain came down and let my visitor know that he was sorry to disturb him, but that we were then half a Mile from Newcastle--Mr. Kean went ashore in the Boat in Company with Mr Mackie--We dropt about two Miles below Newcastle, then let go Anchor--Here we lay all Night, there coming on a thick Fog in the Night which prevented our making Sail--We dismissed our pilot at Newcastle, Capt. Kirby undertaking to pilot the Sloop down the rest of the way. At half past 11, O'Clock got up Anchor, and hoisted Sail; but little Wind; hazy Weather, comes on again and some rain at half past Twelve--This forenoon the Brige Charleston Packet, Capt. Strong passed us as we lay at Anchor--A Ship appears stretching up 4 or 5 Miles off, who must have passed us in the Fog this Morning early. having had Boat ahead towing since we got up Anchor--we found the Tide set us fast toward a Shoal or spit of Land lying off; cast the Lead, and at the last throw by the Captain found but 9 feet Water; he immediately ordered to let go the Anchor; this was done directly; but force of the Tide was such, the Cable instantly parted, and we directly grounded on the Shoal, at about half Tide--a very little distance from our Anchor--After getting in Sails, our Seamen went in the Boat & weighed our Anchor by the Buoy Rope, with very little difficulty, and brought it onboard. Here we lay till about Sunrise next day, having got out another anchor. About I O'Clock in the afternoon we came to, at the Piers, and made fast to the outermost Pier without letting go an Anchor--After getting Dinner, the Captain, Easton, Brown, Mackie, Ford, and myself went ashore (the Captain resolving to wait for a Wind to go down the Bay in the Morning) we went up to the Town of Port Penn and amused ourselves 'till the Evening when we all came onboard. against the dangers of the Ice in Winter, And it is found to answer the purpose very well; last Winter above 50 Sail found shelter there till the navigation was clear. I should have mentioned that on the north side of the other Piers at some distance another Pier is sunk to serve as a kind of outwork to the others in breaking the Force of the Ice coming down. After getting onboard, we spent the Evening very gaily--Mirth and festivity smiled around us--Every Man endeavor'd to contribute to the general pleasure--And every attempt in these cases is received with favour. After getting a little past the Light House, I began to grow Sea Sick, with the usual symptoms, Mackie also sick, & likewise black Rose. The rest of our Company well. Tuesday, November 13. Today we are nearly well--Mackie and I eat our allowance at Breakfast with a pretty good appetite. About 9 O'Clock, the Sea smooth and the Weather hazy we made the Land, supposed about 30 Miles to the southward of Cape Henry--We stood in within about half a Mile of the Shore, and Surff, 6 fathom Water. We have been trying this morning for some Fish, but had no success. We passed Currituck Inlet today--In the Evening we stood off shore, heaving about when within a quarter of a mile of the Shore--We saw 7 or 8 Craft standing up the Coast, we suppose them bound to Norfolk. Friday, November 16. Wind still ahead,--A very brisk Wind and rough Sea today--Spoke a Sloop bound from New York to Edenton.--A brig in sight. A Whale & Sword Fish pass us. I am again sick from the rough Sea--In the evening came on rain--And fell calm; our Vessel rolled and pitched very much--The Captain and people being on deck about 8 or 9 O'Clock, the night dark, in hoisting the Boom from the Larboard to the Starboard crutch, the Boom swinging over crushed the head of one of the Seamen, John, between it and the Starboard crutch in a shocking manner; the poor Man fell on the Deck, and afterwards bled from his Mouth Nose and Ears many Quarts--They got him down into the Cabbin and laid a Sail for a Bed, We expected him to die in a little while--We spent the night very disagreeably--His Groans and the bad situation in which he was distressed us much. On the Bar is 14 feet water, at low tide--On the Swash is 8 feet at low tide; the Tide rises on these Shoals but about----feet on the Bar, and about----inches on the Swash. Sunday, November 18. Hoisted out our Boat and set Mr. Brown on shore near the point, then stood on, up the River 16 Miles further, to Washington; where we arrived about 1 O'Clock--Here a number of Gentlemen came onboard us--Went with David Shoemaker and paid a short visit at his house, returned onboard and dined.--Towards evening took a walk to Mr. Nuttle's, where was Mr. & Mrs. Shoemaker, and Capt. Eldredge; drank Tea there. Mr. Mackie and I return'd and slept onboard. taken up, alongside our Vessel & Capt. Eldredge's; he was put in irons and sent to Goal. I slept onboard. Tuesday, November 20. Mr. Blackledge waited on me, and kindly invited me to fix my residence with him and his brother Thomas, that I should have a Room for myself, and he wou'd furnish me a Horse &c. to be at my command during my stay in North Carolina.--I had engaged quarters at Horn's Tavern, but now conclude to accept Blackledge's offer.--I Breakfasted onboard--Blacklege called down at the Vessel about dinner time, when we walk'd to the House, where he then introduced me to his brother Thos. & to his brother's wife, Polly Blackledge 3. 3 Mrs. Polly Blackledge, the wife of Mr. Thomas Blackledge, was a daughter of Col. Salter. Their residence in Washington was of short duration. They are survived by a number of descendants mostly residents of New Bern. 4 Capt. Nathan Keais, a native of Rhode Island where he commanded a company of State troops during the Revolution. He is put down also, as one of the Captains of the Second Regiment North Carolina troops. He and his wife, Barbara, are buried in the churchyard surrounding St. Peter's Church, Washington. Their descendants are represented in the Hoyt and Tayloe families. 5 John Gray Blount is said to have been the most influential man in Beaufort county in his day. He was a merchant of large enterprise and a patriot of the Revolution. He and his wife, Mary Harvey, daughter of Col. Miles Harvey of Perquimans, are buried in the churchyard of St. Peter's Church, Washington. They left many descendants represented in the Blount, Rodman, Myers, Branch, J. G. B. Grimes and Cowper families. Doctor Loomis & Charles Cooke, all on Horseback, we crossed Tar River in a Scow--rode a Mile or two, then Blackledge pushed on before us, in order to get to Newbern early--The rest of us rode about 22½ Miles, where we cross'd Swift's Creek, on a bridge, this is a branch of Neuse River. 6 General Armstrong was a member of the Pitt county committee of safety, and one of those named to solicit donations for the relief of the people of Boston. He was elected Major of Pitt county militia in 1775; was in active service near Philadelphia, and promoted to Colonel in 1777; elected Brigadier General in 1786, and member of Fayetteville Convention 1789. His home was on the south side of Tar River in the neighborhood of the Salter and Grimes plantations. His name has disappeared from Pitt county, and most of his descendants have moved farther south. 7 (Hist. Pitt Co., by Henry King) "The pretty Miss Cogdell," was the daughter of Richard Cogdell and mother of Hon. George E. Badger, Judge of the Superior Court, and Secretary of the Navy in 1841. Friday, November 23. Breakfasted at Pendleton's--In the forenoon there was a Horse Race five Horses started for the Purse which was won by a Horse called Sweeper--Went to Dine with John Green, by invitation; there was Miss Cogdell, Misses Wright Stanly, Mr. Doiley, & Mr.________ Green, (John's brother)--Towards evening took a walk with John Green to see the palace. We returned to Mr. Green's, where I drank Tea with the ladies. Miss Cogdell's Sister called in the evening; And two Gentlemen came in--I was introduced to Mrs. Stanly--And accompanied the Ladies with several Gentlemen, as far as my way went where I bid them Adieu for the evening. 8 John Stanly often a member of the Legislature from Craven, and a member of Congress from 1801 to 1809. He became engaged in a political controversy with Governor Richard Dobbs Spaight in 1802 which unfortunately terminated in a duel in which Governor Spaight received his death wound. The beautiful house built by Mr. Stanly at such a large expenditure, for that day, is still standing, and is an ornament to the town of New Bern. It is described as "the house in which George Washington was entertained in 1791. And, where Mr. Stanly gave hospitable welcome to Gen. Nathanael Greene, and made a loan to him of forty thousand pounds for the necessities of his suffering soldiers of the Revolution." It is now owned by Hon. James A. Bryan, who served as a captain in the Confederate Army. One circumstance deserves to be recorded to his honour--Altho' brought to Philadelphia from Honduras a Prisoner arbitrarily; and on his arrival sent to Goal by the person who brought him by force yet upon his getting into affluent circumstances, he generously relieved the pecuniary distresses of that very person afterwards; the more meritorious, as upon a settlement of Accounts with that Man, it was found that he owed him nothing, but on the contrary that person was in his Debt--Mr. Wright Stanly brother to John invited me to spend a Week with him at a Farm about 13 Miles from Newbern, where he promises me the diversion of Deer Hunting and driving. 1st. Large numbers of people are drawn from their business, occupations and labour, which is a real loss to their families and the State. The second day, one of the Horses at starting, run violently amongst the people that sat in a place of apparent security, it was precisely the spot where I thought there was the greatest safety, for foot people--More might be added. 9 Samuel Cornell a distinguished Tory; it has been stated that his family was connected with that of Daniel Webster. Sunday, November 25. This morning Mr. John Green called at my quarters, he asked if I had a mind to go to Church; I having no inclination to go, he left me at Church time. The Sunday after the Funeral, the bearers assemble somewhere, with these decorations to their persons and go in a body into Church, where the Minister dress'd in the like manner receives at the door. This custom I had the opportunity to observe today, there having been a funeral last Week, the bearers assembled at the Tavern where I stay, opposite the Church, in order to go into Church together. The Linen is of a convenient quantity to make a shirt after ceremonies are over. 10 Colonel Davie here mentioned was the well-known and distinguished soldier of the Revolution, William Richardson Davie. Col. Davie produced a curious Tobacco Pouch, made of a young Mink Skin, the size of a little Cat, it was dress'd with the hair, Feet and Claws and Tail on, and when thrown on the Table with a bellyfull of Tobacco look'd like a little dead black Cat. In the evening returned to my quarters, where I found Armstrong, and Capt.----, other Gentlemen came in. Monday, November 26. Today, was tried in the Superior Court, the Claim of the Heirs of Samuel Cornell Esqr. for the property that belonged to him in North Carolina; he having gone away in the early part of the War the property being consider'd as confiscated was sold by the Agents of the State--Judgment was given against the Heirs--The Judge & Lawyers in this Country dress in black Robes & white Tunics like parsons. Wednesday, November 28. Breakfasted with John Green--About 11 O'Clock Capt. John Jones & the older Mrs. Blackledge arrived in Gurling's Sloop from Philadelphia.--six day's passage. About noon met Mr. John Stanly in Church Street, he told me he was going to look for me to give me an invitation to dine tomorrow at his house. 11 Judge Samuel Spencer of Anson county held many offices under the Colonial government, and was one of the three Judges of the Superior Courts first elected under the constitution in 1777. 12 Mr. Iredell emigrated to Chowan county from England when 17 years old. He studied law under Gov. Samuel Johnston and married his sister, Hannah. He became a very distinguished citizen of North Carolina. He held office successively as member of the Assembly, Judge of the Superior Court, Attorney General of the State and, later, was appointed by George Washington Associate Justice of the Supreme Court of the United States. In the presidential election of 1796 he received three electoral votes. 13 William Shepard of New Bern was the father of Honorables Chas. B.; William B.; and James B. Shepard; and of Mary, the wife of Hon. John H. Bryan of Raleigh. Road I thought there lay in the path a fine large Orange, which in a moment I concluded had dropt from the pocket of somebody who had been down to Newbern, & was carrying it home; perhaps it might be for a present for his Sweetheart--I found it however to be only a Gourd or Squash in colour & shape like an Orange and is very common in this Country. A few miles further on, I saw two beautiful Woodpeckers with varigated plumage and red towering Crests--Their Note was a repetition in a shrill sound of the word PEAP. They were much larger than any I ever saw in Pennsylvania. 14 Messrs. Grimes, father and son, were Demsie Grimes and his son the first Bryan Grimes. Demsie Grimes was a wealthy and leading citizen of Pitt county; he owned Avon and Grimesland plantations on the South side of Tar River, about twelve miles from Washington. Bryan Grimes was the father of the late distinguished General Bryan Grimes of the Confederate Army; and of the late Mr. William Grimes a highly valued citizen of Raleigh. "Miss Betsy Grimes" mentioned further on was the daughter of Demsie Grimes and married Reading Grist. She was the ancestress of the Grist family of Beaufort county. She is buried in the Grimes burial plot at Avon where repose the remains of three generations of her family. 15 Capt. John Wallace, a citizen of Beaufort county for many years prominent in the seafaring trade and other industries. He was distinguished for energy and activity in business, the late Capt. Alf Styron of Washington was one of his descendants. gave us a good deal of his Company today. &c. introduce many phrases into common Language, at first perhaps ludicrously, which by degrees obtain a currency, and are applied to the business of common life, the Soldier desires you to parade yourself and take a walk with him, he tells you that he visited at such a place, and staid till they began to parade Dinner, then he March'd off, the Sailor finds you lying down, he enquires "What's the matter that you are lying "on your Beam ends? and tells you to "Get up, or Ben "will get to Windward of you for he is eating all the Pie." I am persuaded that many terms introduced in this way ludicrously are adopted at last as classical--It sounds strange to my ear, to hear the people in Carolina, instead of the word carry or carried commonly say, toat, or toated--I asked a boy what made his head so flat he replied "It was occasioned by toating Water. This is the usual phrase--I am told the Joiner charges in his bill for "toating the Coffin home" after it is finished. 16 One of the historic spots near Washington. It was devised by the will of John Gray Blount to his grandson, William Blount Rodman, and became known as "Rodman's Quarters." It was occupied by both Federals and Confederates during the Civil War as a fort, from which point of vantage each at different times shelled the Town in efforts to dislodge the other. It is now owned in part by Mr. Ott Rumley. then halloe the dogs after the rest of the herd.--Returning from the Hunt we saw a Negroe in only his shirt bringing a horse from the fields, he shook with cold. We returned to Washington in the Afternoon. 17 John Bonner, one of the Bonner family on whose land the Town of Washington was planted. James and Henry Bonner were the founders of the township. They have many honored descendants in town and county today. 18 Rev. Nathaniel Blount, familiarly known as "Parson Blount," was a first cousin of the brothers, John Gray, Reading, and Thomas Blount, all of whom are mentioned in the journal. He was a student for the ministry under Rev. Alexander Stewart of St. Thomas church, Bath. He was ordained in London in 1773. In the same year he built "Blount's Chapel," now Trinity Church, Chocowinity. The families of Mrs. Thomas Kingsbury of Wilmington and Mr. Levi Blount of Mississippi represent his descendants. I return'd to Horn's where I spent the evening. Tuesday, December 11. Writing all day at my Quarters till evening, then receiving an invitation from John G. Blount I went and drank Tea at his house. Thos. Blackledge and his Wife were there Blount gives me a general invitation to his house--Doctor Loomis introduced me today to Mr. Hacket, just arrived from Tarborough, and one of Horn's boarders--.Captain Scott and Mr. McKim are also boarders in Horn's family. Wednesday, December 12. Dined at Thomas Blackledge's today on Venison by invitation from him last evening--The Venison was tender and excellent, being part of a Fawn that he with others got yesterday just on the back of Town; they went to look for some Hogs; and some Dogs that were along, giving indications of Game being near, upon looking out they saw this hapless Fawn; one of the Comy fired, and broke its leg; the Dogs immediately catch'd it.--After Dinner Mr. Stephen Cambreleng calling in, I was introduced to him. 19 This was probably a tale meant to amuse the visitor. The woods were full of small game, and the rivers teemed with fish, a resource then, as now for whites and blacks alike. 20 Colonel Kennedy was a wealthy and leading citizen of Beaufort county. His home here mentioned, was a social center of refined hospitality. The house was built about 1750, and is still standing. The foundation which encloses a substantial cellar is built of brick as are the chimneys and both ends, while the front and back of the house are of timber. This presents an unusual appearance for if you approach from the east or west you expect to enter a brick building, but on arriving at the front or rear entrance you see only a frame building on a brick foundation. The interior was elegant in its day, though now stained by age and abuse. The family burying ground nearby is enclosed by a substantial iron fence, but the handsome marble monuments therein are being wrecked by the ravages of time. The place is now the property of the heirs of General Bryan Grimes, who purchased it after the Civil War. 21 Lucy Harvey was a daughter of Col. Miles Harvey and sister of Mrs. John Gray Blount with whom she made her home, both parents being dead. She married Major Reading Blount in 1794. They are buried in their family burial plot, on what was their country home of "Bellefont." This place has passed into other ownership and is subdivided into small farms. I sat a while with the Ladies on our return, then retired to Horne's to my Quarters there I always find a great deal of Company. Tar River like many other Rivers of North Carolina has no tide, other than a small rise sometimes occasioned by the Winds driving the Waters, a Vessel at Anchor usually rides with her head to the Wind. Heavy Rains however occasion considerable Freshes when these happen it is difficult setting and poleing Flats up the River, they often then warp up by Ropes fastened to the Trees on the bank. Mr. Nuttle brought with him to our Quarters this Evening a large Dog, singular for being whelped almost without a Tail, he has now but a short stump about an inch long, it is cover'd with hair just covering the Stump and ending in a point at the bottom of the Stump. Deliver'd letters to Capt. Kirby for Philadelphia for John Kaigher, Benjn. Horner, William Zane, Richard Adams and Polly Attmore, I enclosed the whole in a cover directed for Kaiger & Attmore. No Fire Engine is kept in the place, neither is there any Fire Buckets, If a Fire should happen in a high Wind, the Town might suffer much. By many this place is counted unhealthy, some however are of a contrary opinion. The Merchants export from this Town, Tar, Pitch, Turpentine, Rozin, Indian Corn, Boards, Scantling, Staves, Shingles, Furs, Tobacco, Pork, Lard, Tallow, Beeswax, Myrtlewax, Pease, and some other articles, their Trade is chiefly with the West Indies and with the other States on this Continent; the Navigation not admitting Vessels of great burthen to come up to the Town; and for a large Vessel to lay below to load at the Anchorage near the Bar, is always inconvenient, and sometimes dangerous. Monday, December 17. Rain last night, and Cloudy and wet today--Capt. Kirby sailed for Philadelphia. 22 "Mrs. Salter's house" this was the plantation of Col. Edmund Salter, not far from Avon and Grimesland. It was in recent years the residence of Col. Joseph Saunders of Confederate fame. which is near the bank of the River and commands a fine prospect down the River for a Mile or two,--We went into the House, Mrs. Salter is Mother to Polly Blackledge and Sally Salter, that I have mentioned to you before, Sally & her Mother were both at home, as was Peggy, another daughter; a very pretty and agreeable Girl; my fellow Traveller, I soon found, had prepared an oblation, he produced from his pocket several fine Oranges which he presented to the Mother and Daughters, he had also Letters for Miss Sally, from some of her Friends at Washington--Mrs. Salter invited us to stay and take Coffee; and afterwards to lodge there, this seeming to be more pleasing to Mr. Jones, than to go on further, I readily agreed to it--And our Horses were put up. We spent the evening in conversation on different subjects, amongst the rest a good deal was said on Religion--At length Jones & I retired to go to rest, we found two Beds in our room, and proposed to ourselves each to take one to himself, but my fellow Traveller upon examining the one that by tacit consent had fallen to his lot, found it to be without Sheets, this circumstance rather disconcerted him, as I believe he had before heard me say, that I had as lieve sleep with a Snapping Turtle or a Two-Year-old Bull, as with a Man, However I soon relieved him by declaring that in present circumstances his Company would not be disagreeable, and we tumbled in and went to Sleep. 23 "They neglected to ask us whether we had breakfasted." This was probably not from lack of hospitality on the part of Miss Betsy Grimes, but was occasioned by the strict etiquette of that day. A young lady of her high position would have committed a social error had she entertained strange young men in the absence of her parents. Her mother was dead and her father and brother absent on business, therefore, "they seemed rather embarrassed with our company." GREENEVILLE, so called in Honour of General Green, is the County Town of Pitt County; it is situated on the Southeast side of Tar River, at this place about 90 or 100 yards over, when the River is low; tho' near a Mile wide when there are freshes in the River, and it is here about ten feet deep.--The Village consists of about fifteen families, and is a place of some Trade, the planters in the vicinity, bringing their produce to this Landing. The Town stands high and pleasant. 24 A street in the town of Washington commemorates Mr. Van Noorden's ownership of a part of the original land. Jones and I, set out about Sunrise from Mrs. Cobb's and rode eleven Miles to Tarborough before breakfast--riding over a Bridge built of Wood at the Town, over Tar River. TARBOROUGH, is the County Town of Edgecombe County; it is situated on the Southeast side of Tar River, at this place about eighty yards over, the Town contains about twenty Families, and for the size of it has a considerable Trade, it is the highest Town on the River, and Boats seldom go above this place.--The houses are all of Wood--It is situated on a high flat piece of Ground, and is a very pleasant place. availed themselves of the indulgence; and came riding into Town with the Tobacco rolling after them. They throw away the Shafts on their arrival and return home on horseback. It may be here observed that Pitch, Tar, & Turpentine are rolled to the Landing from the Woods, partly in the same manner; in these, the Axle, is one Stick drove quite through the Cask, and wedged so as not to work loose, leaving a Shank at each end which when it arrives, is sawed off, leaving the rest of the Stick in the barrel--They do not take the trouble to fix Cleets to the barrels, the cask rolls upon the Hoops,--Two barrels are often drawn together, the last one is fixed by a box at each end reaching to the end of the Shafts. hoops fixed as at first, then being rolled to the Scales the Cask and Tobacco therein are weighed together, and the gross weight being marked on the head, over the Tare weight first marked; the neat weight of Tobacco may easily be known by subtracting the Tare. The Inspector now makes an entry in his Warehouse Book, of the Hogshead with the weight, and affixes a Number to the Cask, which he also enters in his Book; he gives to the planter a Note or receipt for the Cask of Tobacco, expressing the Number, weight and Tare, and receives the Hogshead of Tobacco into the Warehouse, where it may lay till the Tobacco of the next Year comes in; the Planter pays for its examination and Storing Five Shillings.--The Planter has now no further trouble with the Tobacco; his Note or Receipt is transferable like a Bill of Credit merely by the possession of it, and he may sell his Note when or where he pleases; the buyer when he wants to remove the Tobacco, presenting the Note, and the identical hogshead is delivered to him--Confusion is prevented, by numbering all the Tobacco that comes into the Warehouse in one Crop, regularly from No. 1 to the end. If the Planter has any ordinary Tobacco in his Cask, it is taken out, and he may sell it to whom he pleases, but cannot get a Note for it. The Inspection or Warehouse is a large framed house of Wood; it is 160 feet long and about 50 feet broad.--It is near the bank of the River. A new regulation is proposed in this State in regard to Tobacco to class it in three divisions, No. 1, to be of the first quality, No. 2, of the second sort, and No. 3, to include all ordinary and trash Tobacco however mean without rejecting any. and standing on brick Pillars; in the long Room the Commons met, in the other the Senate--Any person is at liberty to go and hear the debates of either House, Standing uncover'd without their Bar--The bar at the Senate was a Board laid across two old Trunks, standing on the ends which served very well pro tem. Leaving Blackledge--I was introduced to Mr. ---- Ross, a Merchant--At dinner I returned to Richard Blackledge's, here was a large Company, amongst others Judge Williams 25. 25 Judge Williams of Williamsboro. The Governor and I, had a long conversation on various topics, and I retired to bed pretty late. Having this Morning seen Mr. Gilchrist, he told me that he had expected me to Breakfast: he invited me to dine with him, and desired that David Jones would come also.-- I took a walk to the Tobacco Inspection; the price of that article is 50/ per 100 lb. part to be paid in Goods-- David Jones and I went to dine at Mr. Gilchrist's, after Dinner the Governor came in; most of the Company except him retiring, he & I had a long tète a tète Conversation-- He kindly invited me to pay him a Visit if I should come in the neighborhood of Edenton where he resides, which I Promised. In the evening I went to visit William Tuton at Mr. Greir's, here was Benjamin Brown and William Ford-- In the evening I walk'd to Richard Blackledge's where I took Tea, then returned to Mr. Greir's where I eat Supper-- Two back country Assembly Men came in, one named Gardner from Surry County, we had a long conversation on the subject of paper Money; one of the Assembly Men seemed to think Merchants of little benefit to the Country and said that he wished there were none for 100 Years to come. It growing late we could not end our subject, but the Assembly Men said that next evening they were at our service for further debate. I staid and slept with Benjamin Brown. Saturday, December 22. I breakfasted and dined at Toole's. There was Snow, Sleet and Rain all day--They were out of Wood at Toole's, and we suffer'd there for want of Fire--In the evening I saw Mr. Gilchrist, he invited me to lodge at his House, letting me know that he expected me last night. I drank Chocolate there. 26 General McDowell was probably Charles McDowell as he was older than his brother Joseph; both were participants in the battle of King's Mountain. "There was a large old Tree with a hole in it, very high up, some of us went there, and we thought it was likely there was a Bear down that hole, I got an Indian Ladder (this is a Saplin with the Limbs cut off, about a foot from the Stock so as to take hold with the hands and feet in clim'ing) this Ladder, I set up against the Tree, and getting a long Pole with a flaming brand on the end of it, got up the Ladder, with the Pole, and held the Fire to the hole in the Tree which soon took Fire, the Smoke and heat forced out a full grown Bear who descended so fast, I was at last obliged to drop myself to the ground, here I had left my Gun, and just as the Bear was reaching the Ground, I fired and broke his back, we then dispatched him with the Axe, -- Soon after another Bear called a Yearling came out and descended we knock'd him on the head also with the Axe-- And there came out of the hole, one more Bear, also a Yearling, he ran out upon the boughs of the Tree, and there being a bad Marksman in the Company, We set him to Shoot this Bear, and after firing many times he at last hit him and brought him down--"
As I grew very sleepy I retired to bed. This evening the Assembly finished their Session and broke up. Sunday, December 23. It is very much the custom in North Carolina to drink Drams of some kind or other before Breakfast; sometimes Gin, Cherry-bounce, Egg Nog &c. several of the Assembly Men, this Morning indulged themselves in this respect. General Thomas Parsons came in and staid a short time--I breakfasted at Mr. Gilchrist's and dined at Captain Toole's. The Assembly Men push'd out of Town this forenoon in great numbers, many of them appearing very anxious to get home. 27 "Mrs. Harvey" was Ann Blount, widow of James Harvey, the young son of Col. John Harvey the distinguished Moderator of the Assembly held at New Bern, in 1774. She made the trip on horseback from Pitt county across the mountains into Tennessee to visit her brother, Gov. William Blount. She died there and her remains rest near his in the Presbyterian churchyard, in Knoxville, Tenn.
28 Doctor Hugh Williamson, though born in Pennsylvania, was largely associated with North Carolina. He represented Edenton in the House of Commons in 1782, and was sent to Congress from that district in 1784. He was one of the signers of the Constitution from this State. He was again in Congress from 1790 to 1792. He wrote a history of North Carolina in 1812. Major Blount, Colonel Thomas, &c. We had a good deal of conversation. I went to Mr. Gilchrist's to lodge. Monday, December 24. I breakfasted at Mr. Gilchrist's today, & dined at Capt. Toole's, I visited William Tuton upon business, he offers payment in Lands for a demand we have, could not agree about the terms. The Assembly of North Carolina, consists of two Commons and one Senator for each County in the State; of these Counties there are about sixty. The Legislature meet the first Monday in November by Law,--Some of them came to the Assembly to Tarborough 800 Miles, these came from the settlements about Cumberland River. These Members encamp in the Woods returning home, part of the way; the country is settled as far back as 3 or 400 Miles. In the evening I rode out to Edward Hall's Farm about two Miles from Tarborough upon business, he inviting me to stay all night, I accepted his invitation--The evening Moon light, and has been a fine day. Bowls, were divided the Yolks and whites of five Eggs, the yolks & whites separated, the Yolks beat up with a Spoon, and mixt up with brown Sugar, the whites were whisk'd into Froth by a Straw Whisk till the Straw wou'd stand upright in it; when duly beat, the Yolks were put to the Froth; again beat a long time; then half a pint of Rum pour'd slowly into the mixture, the whole kept stirring the whole time till well incorporated. After Breakfasting I returned to Tarborough. I dined with Andrew Grier. After dinner saw a dance of Negroes to the Banjo in his Yard. In the afternoon I set off for Washington, after riding a few Miles I overtook Brown, Tuton &c. who were going down the Road,--We stopt at Mrs. Cobb's, took a drink, and rode to Jone's Tavern being some in the night. mounted on a Poney a little bigger than a Goat, the first notice I had of him was by his giving a Whistle behind me. ATTMORE, Where was you born, boy? POLYDORE, I was born in Guinea. ATTMORE, Don't you want to go back to your Country? The other Negroe answers--He is fast, he can't go. ATTMORE, Had you not better have let them alone and remained in peace at home? ATTMORE, And what would do if you return'd to your Country now, wou'd you be quiet? There is an elegant house in this place called the Palace, formerly the residence of the Governor many of the houses are large and commodious some are one story and some two Stories high. 29 This was the present "Christ Church" New Bern, originally Craven Parish, established by the Vestry Act of 1715. (See Colonial Records Vol. II p. 209). The two royal Governors, Tryon and Martin attended this church during their occupancy of the Palace. A very handsome silver communion service and alms basin, also Bible and Prayer Book, each bearing the Royal arms, the silver engraved "presented by George the II, King of England," are in the possession of the present Christ Church. The records of this Parish were destroyed by fire many years ago, and the tradition to which the memory of man runneth not to the contrary is that these particular articles were presented to Christ Church by George II. However, Bishop Joseph Blount Cheshire is inclined to the belief that this eucharistic service with accompanying Prayer Book and Bible were originally given to the Royal Chapel of St. Philips, at old Brunswick and that when New Bern became the seat of the Royal Government under William Tryon he transferred these sacred and beautiful articles to Christ Church, New Bern, and gave it the distinction of being the "Royal Chapel." To the historian this belief is quite tenable and only enhances the historic interest that clusters around this old Parish. here with a square tower, Cupola and Bell & it is the only place of Worship in the Town. This place being the County Town of Craven County, there is a brick Goal here, and a Court House, the latter is raised on Arches; the Courts being held upstairs, the lower part serves for a Market place; tho' but little provisions are carried there; people coming in Boats or Canoes sell their Marketting at the River side.